Born in 1894, Jacques Henri Lartigue most likely could have used platinum printing. However, no platinum prints by him have ever been found, nor has any reference to such a process been seen in the numerous diary entries in which he described his early photographic endeavours. Michael Hoppen, whose gallery in London works regularly with the J.H. 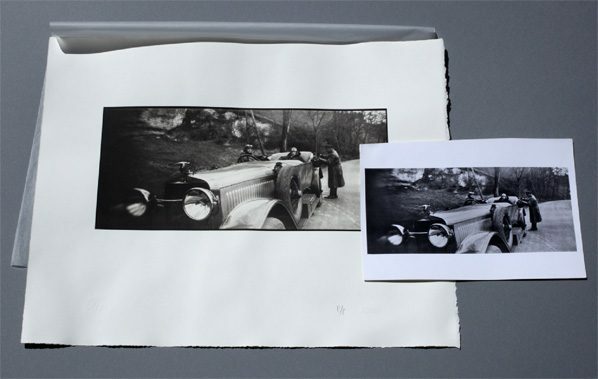 Lartigue Donation, sees platinum printing as a way to further enhance photography. He inspired the Donation to select 22 iconic images for a limited edition of 35 prints, which were shown during the summer of 2003 in the gallery”s exhibition “The age of elegance and the art of style.” The printing was done by Max Caffell in his 31 Studio laboratory in England. The following short film gives us an idea of Caffell’s platinum printing world. The platinum printing process involves a contact negative being enlarged to the format of the required finished print. A photosensitive emulsion containing platinum or palladium particles is coated onto the paper, which is then exposed through a negative and developed in a series of solutions until the image appears. In 1873 William Willis first patented the platinum printing technique in England. At this point, the technique consisted in employing platinum salts in combination with light-sensitive ferric salts. The procedure was gradually simplified and the results became more reliable in comparison to the first impermanent images. In 1979 Willis founded The Platinotype Company to market pre-coated sensitized paper. The platinum process gained popularity in England, rapidly spread to the U.S., and was widely used at the turn of the twentieth century. Platinum prints were largely favoured because of their tremendous tonal range, exquisite detail, surface quality and permanence. Other photographic techniques such as coal printing and gum bichromate printing were more currently used in France. In the 1930’s, platinum became too expensive and the process declined. However, it was still used by some photographers such as Irving Penn, Robert Mapplethorpe, Edward Weston and Bill Brandt.